President Obama calls Gregg a "master of reaching across the aisle"
WASHINGTON (CNN) -- President Obama extended a political olive branch to the GOP on Tuesday, nominating Sen. Judd Gregg, R-New Hampshire, to head the Commerce Department. 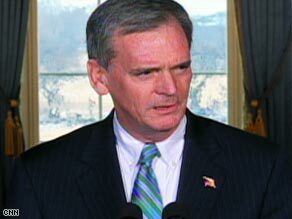 GOP Sen. Judd Gregg accepted President Obama's nomination as commerce secretary Tuesday. "Clearly, Judd and I don't agree on every issue, most notably who should've won the [presidential] election," Obama joked in announcing the nomination, "but we do agree on the urgent need to get American businesses and families back on their feet." Gregg will be an "able, persuasive ambassador for industry" because he is a skillful negotiator and a "master of reaching across the aisle to get things done," Obama said. "We are ... in the middle of a very difficult economic time," replied Gregg, who has chaired a key Senate commerce subcommittee. "This is not a time for partisanship. This is not a time when we should stand in our ideological corners and shout at each other," he said. "This a time to govern, and govern well." Gregg's decision to accept Obama's offer represents a stunning turnabout -- he voted to abolish the Commerce Department in 1995. If confirmed, he will be the third Republican to join Obama's Cabinet, following Defense Secretary Robert Gates and Transportation Secretary Ray LaHood. New Hampshire Gov. John Lynch will appoint Bonnie Newman, Gregg's former chief of staff, to replace him, the governor said Tuesday. One potential stumbling block to Gregg's nomination had been the issue of the veteran lawmaker's replacement in the Senate. Democrats hold 58 seats in the Senate, with a Minnesota seat subject to legal challenge. Democrat Al Franken holds a 225-vote lead in that race, but Republican Norm Coleman is challenging the the election recount. If Lynch had named a Democrat to replace Gregg, the Democrats could have had a 60-seat majority, which is needed to overcome Republican attempts to use filibusters to block legislation. "It is important that President Obama be able to select the advisers he feels are necessary to help him address the challenges facing our nation," Lynch said in a statement Monday. Newman, most recently the interim president of the University of New Hampshire, also worked in the White House during the first Bush administration and was an assistant commerce secretary during the Reagan administration. Obama had nominated New Mexico Gov. Bill Richardson to be commerce secretary, but Richardson withdrew in early January. He cited the distraction of a federal investigation into ties to a company that has done business with his state. CNN's Ed Henry and John King contributed to this report.